Just about every July 4th we spend the holiday at our camp in the Adirondacks with friends and family. Since you can only get there by boat, we carefully plan our menus in advance. We have a refrigerator that runs on propane to keep food (ahem, and beer!) cold. The refrigerator runs on propane gas. 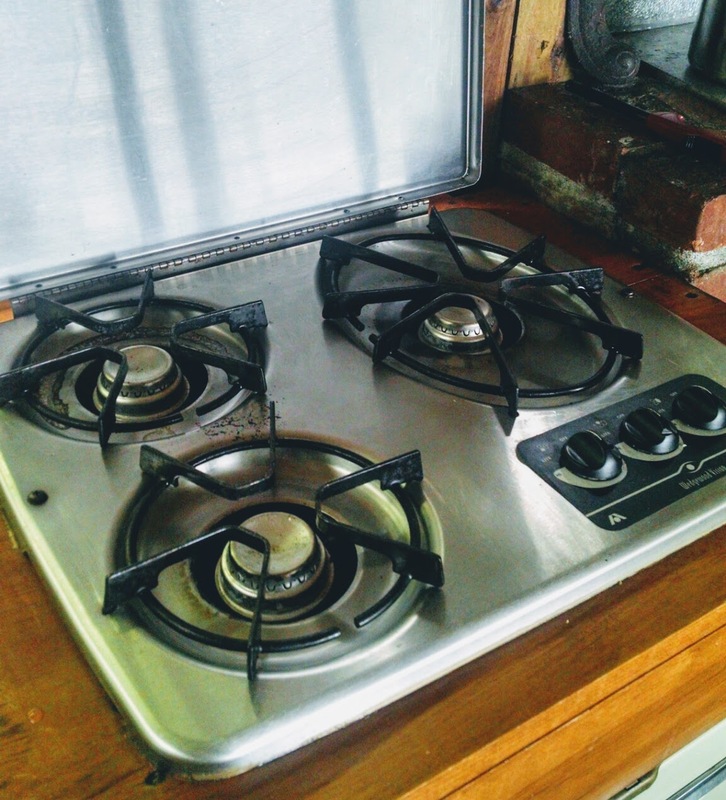 For cooking we have a three burner gas cook top and a gas grill. An easy crowd pleasing meal that practically cooks itself is grilled turkey. 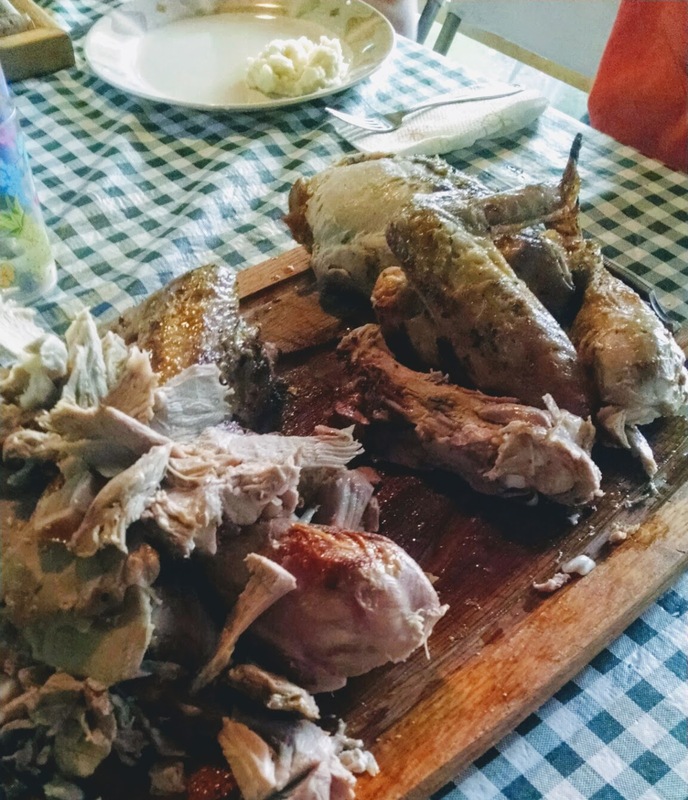 At Thanksgiving when turkeys are on sale I buy a small turkey – 12-14 pounds and freeze it for summer grilling. I usually roast the turkey whole but this year I decided to do things differently. Instead of roasting it whole I wondered how I could cook it faster which then got me thinking that if I think of the turkey as just a really big chicken and cut it into pieces, it should cook way faster. Therefore I could spend more time relaxing AND use less propane. So I cut up the turkey the night before cooking and seasoned it with salt, pepper, celery salt, ground thyme and oregano. Then I put the pieces in plastic bags to season overnight. With the leftover pieces – bones, neck and other innards – I made a quick stock by adding water, salt, pepper, celery seed, an onion and a few baby carrots. After simmering for an hour, i took the meat off the bones and chopped it up along with the liver and other goodies for the dog. I tossed the bones and veggies and refrigerated the remaining stock. That’s what’s in the jar. Cover tightly with foil and cook over indirect heat for 50 minutes to an hour. The turkey is done when the meat thermometer reaches 160F. Crisping the skin . . . While the turkey was resting, I made gravy using the quick stock I made the night before. And it turned out great. I made the gravy on the grill in the same pan I used to cook the turkey. We had mashed potatoes, corn and broccoli to round out the meal. I’ll definitely be doing this again. Normally a 13 lb. turkey takes about 2 1/2 to 3 hours. Using this method, it took about half the time. Yes! Tender, moist and perfectly seasoned. We ate ourselves silly. After dinner, we cleaned up and headed down the lake – about a 15 minute boat ride to watch the fireworks. I have to tell you, the town of Long Lake puts on one heck of a fireworks show. They really do it. If you’re ever in the Adirondacks on the fourth of July, I highly recommend you check it out. I only had my phone for pictures, so you can’t really see how bright orange the sun was but you can kind of get an idea by looking at how bright the reflection is on the water. Nearly dark. Almost time for the fireworks! I hope everyone had a fun holiday weekend and if you haven’t tried it yet, grill a turkey. You’ll be glad you did.